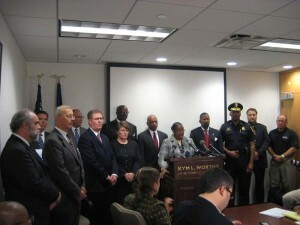 Prosecutor Kym L. Worthy has charged 10 men in connection with an organized scheme to steal and fence laptop computers from Detroit Public Schools from December of 2009 through 2010. The investigation revealed that approximately 104 computers valued at over $158,000 were stolen. In February 2010 the case was referred the Wayne County Prosecutor’s Office by Emergency Financial Manager Robert Bobb and former Detroit Public Schools Inspector General John Bell. The charges are the result of a collaborative effort involving the Wayne County Prosecutor’s Office Public Integrity Unit and Criminal Investigations Division; Detroit Public Schools Inspector General Wilbert Marsh, Deputy Inspector General Diana Sobczak and Special Investigator Robert Barenie; Michigan State Police; the FBI; High Intensity Drug Trafficking Areas (HIDTA) and Absolute Software. Dell and Apple Macbook computers were stolen from Coffey School, 17210 Cambridge, Detroit, MI; Burns Elementary School, 14350 Terry St., Detroit, MI; Northwestern High School, 2200 W. Grand Blvd., Detroit, MI; and Westside Academy Alternative School, 1851 W. Grand Blvd., Detroit, MI. The computers were then sold on eBay, Craigslist and to friends and acquaintances of the defendants. Three defendants, Brian Rogers, Dwaine Scott and Mark Scott have been identified collectively as members of the Helly Helly Bois gang and have been charged with Conducting a Criminal Enterprise, a 20-year felony. They allegedly broke and entered into the schools and stole computers, later selling them to others. Brian Rogers, Dwaine Scott and Mark Scott along with Jaisaun Holt, Dezmen Faqua, Juan Legardy, Dion Sims, Nicholas Tisdale, Danny Tiwaini and Christopher Schambre have been charged with Receiving & Concealing Stolen Property. The investigation in this case revealed that stolen Detroit Public Schools computers were found in Arizona, California, Michigan, Florida, Ohio, Tennessee, Canada and the United Arab Emirates. “The Office of the Inspector General and DPS Police Department will continue to dedicate resources, including partnering with local and federal law enforcement when necessary, in order to bring to justice those responsible for stealing property from our schools and as a consequence depriving many of our students the tools they need to learn and compete,” said Inspector General Wilbert V. Marsh. This entry was posted in Info News Center, News and Press Releases and tagged DPSPD, Emergency Manager.